You must have a member account to access the personal Wedding Planner area. If you have already registered, log into your account using the login below or at the top of the page. If you haven't registered yet, please do so now to utilize all of the wedding planning tools available and to start building your FREE wedding website. You must be logged in to add a vendor to your favorites list. 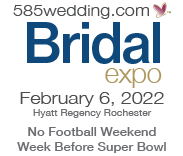 If you do not have an account with 585wedding.com you can create one by clicking here or by clicking on the "register now" button located at the top right of this page.